Ever felt overwhelmed with everything around you while you're Urban Sketching? Or maybe despite everything going on around you, you can't seem to see a story in your surroundings? When I'm stuck at either of these extremes I find that an architecture guide can change what I see. Whether by focusing in my attention like a microscope, or giving me a sense of something larger like a telescope, the context these guides provide revitalize the city to me. Ooooh, there's a helicopter landing on that building! Chicago offers several guided architecture tours that walk, ride, kayak or segway around the city. 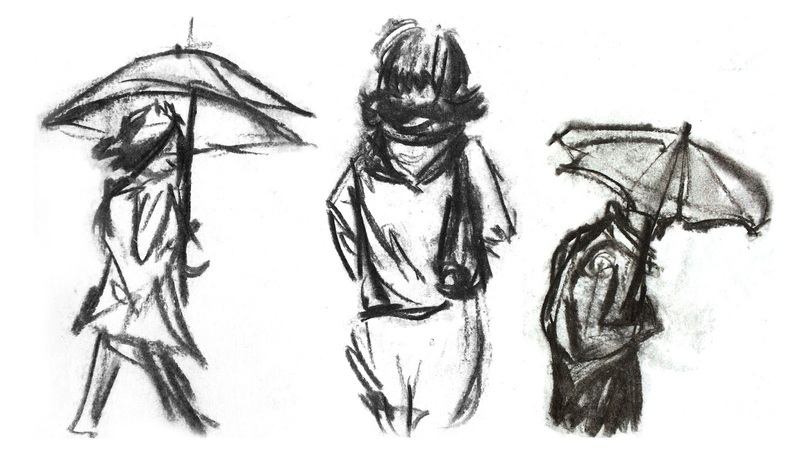 These options can be rich with hidden stories about the city, but as a part of a group, you can't stop and sketch whenever you like. Thankfully there are other great options! There are always standard tourist guide books. These books are full of fun stories about people and places in the city to jog your creative juices, but to those who have been in the city a while or just want something a little off the beaten trail this might not be best. 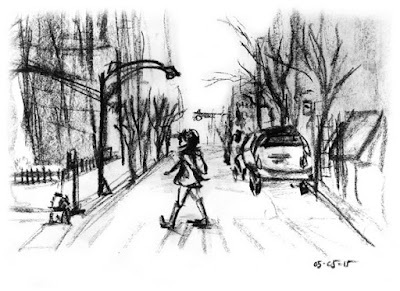 There are also books like Walking Chicago that offer routes in a given neighborhood. Sometimes themes emerge on a given route and you realize you've been walking by 4 first attempts at various architectural elements for months without knowing. 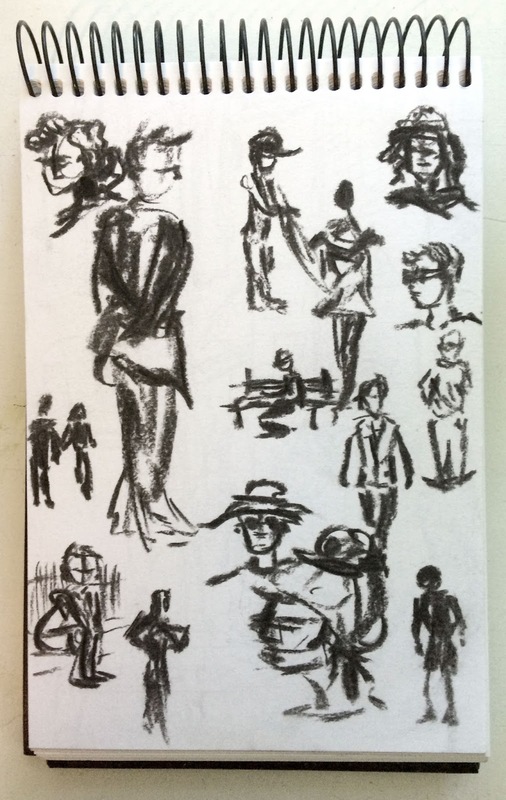 Another publisher offers 50 of these routes on individual index cards – perfect to tuck into a sketch kit. But be warned, these haven't been updated in a few years so restaurants have changed! Though I have not personally tried their tours, I've heard good things about Evisitorguide.com and the free tour maps and information you can download from their website. Of course there are always things that are left out from these books (and website), but they can add a lot of fun to your sketch outings! The problem with books for the Urban Sketcher is that they can be heavy and a pain to carry with you at all times. Thankfully, there are multiple apps for that! Several of the apps for sale look great, but the only app I've tried is a free one called 312 Go! With locations services turned on on your smart phone, the app will point out interesting things around you. The narrator will say things like "On your left is The Rookery…" then go on to tell you fun tidbits about the place. Using this app with headphones also helps prevent unwanted conversation with by-standers while giving you an inside scoop on the stories around you. Looking to try one of these out? Itching to keep practicing the techniques you learned this summer? Perfect timing! October 17th-18th is Chicago's Annual Open House Chicago, where great buildings will be open to the public free of charge. Last year USK Chicago made it into several hard-to-visit buildings during the event, I can't wait to see where you all go! 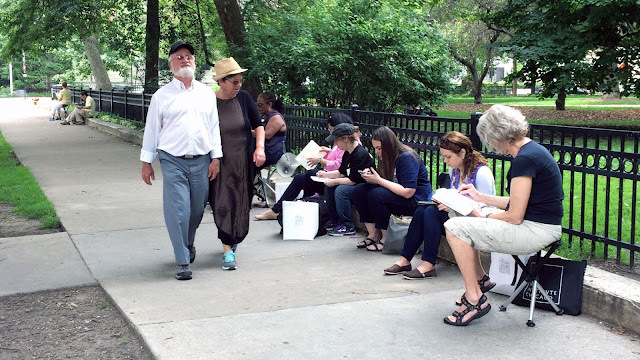 Have you ever used architecture guides to help your sketching in Chicago? How about when you're in other cities? What other tools do you use to help you "see" your surroundings again? As I’m flipping through my sketchbook and mourning the end of summer, I’m reflecting on all that I learned about urban sketching this season. I especially wanted to share some tricks I picked up at the annual sketch seminar. In case you missed it, here’s a recap of the class I taught "Capturing Figures in Motion." 2. Moving figures are super frustrating. So what’s the trick? Well, there’s not just one, but a BIG one that might make all the difference is having an open mind. 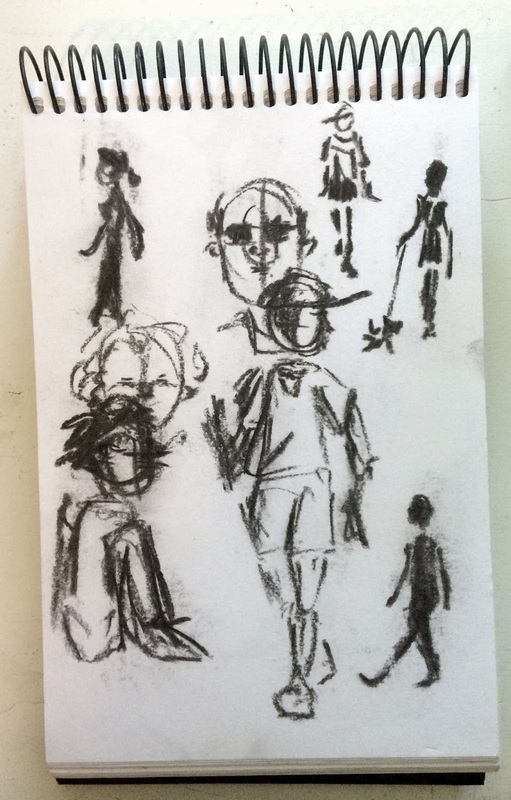 I’m used to long commutes and having a good 20 minutes to make a decent drawing, but when you’re sketching from the sidewalk, you’d be lucky to get a 20 second glance of a passerby. You have to change your expectations. It’s a different way of sketching, but no less impressive. 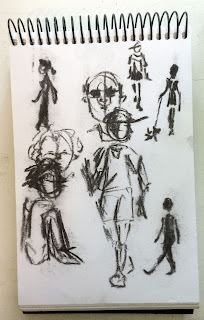 Find a busy street and set yourself a goal like, “Today I’ll draw motion for half an hour.” I encouraged everyone at the seminar to grab a stick of vine charcoal. It’s really messy and takes some getting used to, but it forces you to stay loose and let go of the details. The results may not be readable to anyone other than yourself, but you’ll start to build some muscle memory of how people move, where their weight shifts, how a pair of pants hangs etc. When you look back at your book you’ll have all of these wonderfully expressive reference pages to enrich your urban settings. Were you sketching a crosswalk and only got down half a woman? Fill in the gaps by looking at some scribbles you have in your gesture library. Think about it like an athlete; warm up sketching, or gesture drawing, is awkward at first and can be embarrassing. There's no doubt it's a lot of hard work! But keep at it and before you know it you'll have trained your brain to rapidly record motion. When you do get a decent motion sketch, you should be really proud of yourself and post it everywhere! You recorded all that information in a matter of seconds… That’s pretty amazing! I learned a long time ago that I like hatching as a sketching technique. It’s efficient, effective and it is almost effortless. "Efficient" because you can literally use just one pen and a pad of paper to hatch your sketch. "Effective" because you will not have to convert your sketch to a halftone conversion in order for your sketch to be reproduced in the newspaper or magazine article. I say almost effortless because sometimes it does not work out the way I had planned. ISSUE: The resulting sketch did not match what you envisioned in your head. 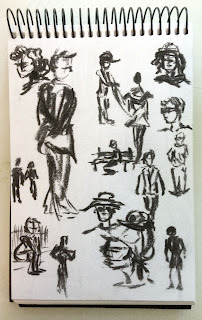 Believe it or not, this sketch of the woman on the train (at left) is messed up--the hatching was too light and I stopped short of completing the texture in the lower half of the sketch. Perhaps I was in a rush to finish this before I had to depart the train or I got tired of making little hash marks? Who knows? Regardless, it is fixable. 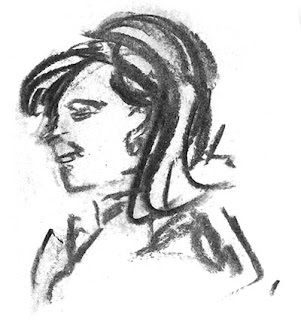 TRY THIS: Keep this sketch and move to the next page and create a new sketch. The beauty of sketching is that you can always try, fail and learn. In the case of this sketch, I could go back and add in more cross-hatching and a frame to finish off this sketch. ISSUE: Maybe it came out too dark and it looks like the subjects changed ethnicity or the female grew a 5 o’clock shadow. TRY THIS: You can use a blank page and just practice different styles of hatching with different pens. When you find the pen that makes the marks you like, make note of it for the next sketch. 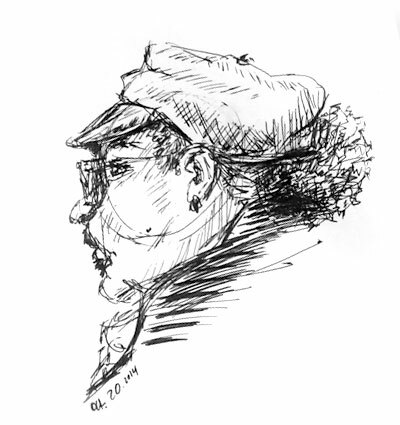 In the case of this couple at the Jamba Juice, I went back over the problem areas with white paint and lightened the heaviness of the hatching, particularly on the man's face. One other thing this sketch could use is a frame to give the lines a place to end. As it shows right now, the lines fade off arbitrarily and pull the eye away from the main subjects. ISSUE: The direction of your lines did not enhance the shape or sense of volume for the subject. The lines should indicate the way a surface reflects light, folds or wraps around an object. TRY THIS: Pay attention to the surfaces as if they have a grain to them and make your lines follow that “virtual grain direction.” Take a close look at the motorcyclist above and notice how I changed the direction of the hatching to convey the wrinkled pant material, the shape of the tires and gas tank and even the boots. ISSUE: What if the style of hatching I chose does not go well with the subject matter? TRY THIS: If you haven’t gone too far, paint white over your curly-cues and try again with linear or cross-hatching. If you have covered the building, like I have in this sketch at left, you might be best to start over and try a new hatching style. Another trick I like to do: when you are finished with your line drawing, stop and scan or make black & white copies of your sketch. Take one of those copies and try out a hatching technique to see if you like the line quality and linear direction. If all goes well, you can now create your hatching tones on your original sketch. This coffee house was one where I did not like the original attempt because my light source was off. But I came back a few months later, redrew it, and applied a different hatching technique to where I like this much better now. Please tell me that you have had hatching issues as well and how did you fix them. I can't possibly be the only one with these issues, right? Help!